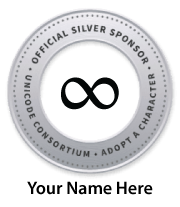 The Unicode Blog: Support Unicode with an Adopt-a-Character Gift this Holiday Season! Support Unicode with an Adopt-a-Character Gift this Holiday Season! This holiday season you can give a unique gift by adopting any emoji, letter, or symbol — and help support the Unicode Consortium’s mission to enable all languages to be used on computers. Three levels of sponsorship are available​, starting at $100. With over 130,000 characters to choose from, you are certain to find an appropriate character, for even the most demanding recipient. All sponsors will receive a custom digital badge featuring the adopted character for use on the web and elsewhere. Sponsors at the two highest levels will receive a special thank-you gift engraved with the name you supply and the adopted character. The program funds work on “digitally disadvantaged” languages, both modern and historic. In 2018 the program awarded grants to support work on improved keyboard layouts, additional work on Mayan hieroglyphs, and more historic Indic scripts, among others. To date, the Adopt-a-Character program has had over 500 sponsors. Be part of the next wave, with a worthwhile gift! For more information on the program, or to adopt a character, see the Adopt-a-Character Page.